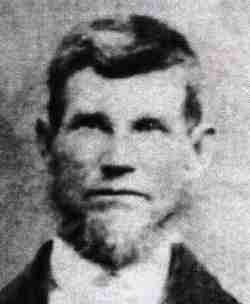 EZRA HOUGHTON CURTIS, a MORMON SHOOTER AND CLUBBER, a 2nd Lt. in the Iron County Militia; son of Enos Curtis and Ruth Franklin. 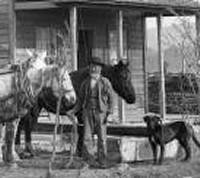 He was a farmer and the family home was in Provo, Utah. Married Lucinda Carter Dec 18, 1846, Kanesville, Iowa (daughter of Domimcus Carter and Lydia Smith, of Maine, pioneers 1851, Joseph Home company) She was born Jan 14, 1831 Their children Lida b Sept, 1848 Maltssa Jane b July 26, 1850, m James H Kennedy, Delia b May 24, 1852, m William Jenkins, Ezra b Aug 13 1854, m Mary Ann Whipple, Sidney b Jan 16, 1868 m Mary Ann Andrews, Lorenzo b Nov 5, 1861, m Eliza Mott, Ruth b March 4, 1870, m Harry Payne Hannah Eliza b Feb 2 1863, Wilford b May 27, 1874, m Bertha Harward, Olive Lucinda b Oct 30, 1856, m Samuel Harding, Laura b Oct 23, 1864, Isabell b Dec 31, 1866, m Earnest A Shepherd Family home Provo, Utah. When the larger photo is viewed by clicking on the image, one can see items possibly stolen in the mass murder/robbery from the massacre victims. (Click on image for more information). Married Juliaette Everett, who was born April 15, 1839, Their children Isaac b Dec 22, 1856, James b Sept IS, 1858, Elizina b March 3, 1866, m Benjamin Watson Franklin b June 3, 1872 Adelbert b April 9, 1879 Elizabeth Elnora b Jan 26, 1863, Everett M b Aug 31, 1870, m Sarah E Draper Family home Provo, Utah. Site information contributed by MARK MOULTON.